This Master thesis is on the application of Markov Switching Vector Autoregressive Models (MS-VAR) and their predictability to portfolio choice under regime and parameter uncertainty. The main contribution of this thesis is the extension of such models with Time Varying Transition Probabilities (TVTP). Furthermore their multivariate specifications, their sampling algorithms and marginal ordinal densities are provided. We investigate long term asset allocation for buy-and-hold investors that can allocate to stocks, corporate bonds or cash. We identify two stock market regimes where the first regime has approximately 55% higher annualized volatility relative to the second regime. We use stock market predictors such as Dividend-to-Price Ratio, log Stock Variance and Excess Bond Returns to separate the regimes. 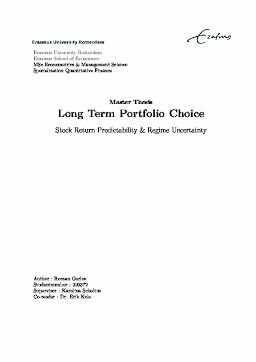 By accounting for predictability for stock market regimes we find that these models increase certainty equivalent returns (CER) for buy-and-hold investors with investment horizons starting from 1 year, therefore these type of investors should account for regime predictability in their return forecasting models. This results in higher capital allocations for both stocks and bonds at the expense of cash relative to constant transition probabilities. Buy-and-hold investors with very high risk tolerance may ignore regime predictability if their investment horizon exceeds more than 6 years.